So finally, ladies and gentlemen, I can scratch off Jeju Island on my bucket list now. At first I thought there’s no way I could go to Jeju seeing that working culture in Korea is quite a time demanding activity, but thanks to our 5 days Chuseok holiday, it made my trip to Jeju possible. I personally would like to thank WINK TRAVELS for organizing everything, from itinerary, to accommodation and transportation. 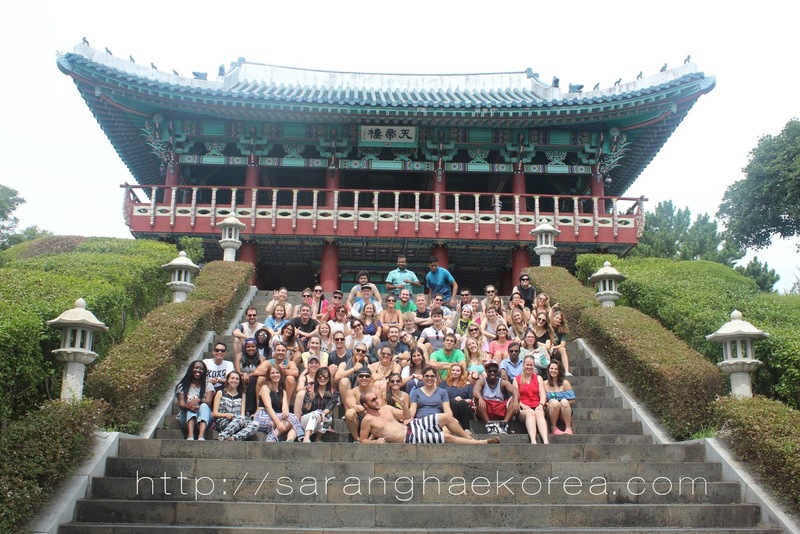 I shared my Jeju trip with 89 other awesome people, most of them are from the English Speaking countries like the US, South Africa, Canada and Australia and most of them are here in Korea to teach English. 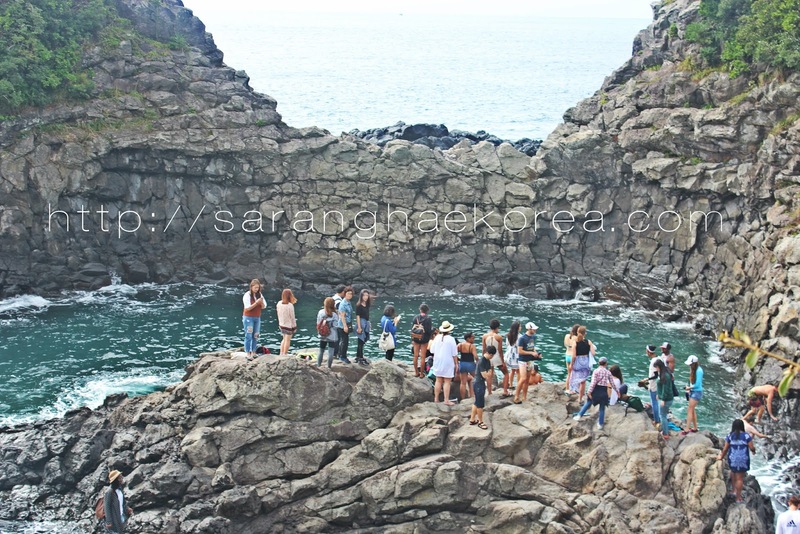 The Jeju trip was I think one of the most interesting trips I made in South Korea because I was with interesting people and at interesting place. It was such a refreshing journey for me because Jeju Island is so unique. I’ve been to several places in South Korea, but nothing compares with Jeju Island. I don’t want to play an expert on this because it was my first and only visit to Jeju Island, so I would just like to bring this on a personal level based on what I saw and what I experienced. If you’ll ask me what to visit and what to do in Jeju island, I could not answer that, but what I can share though is about the things in Jeju that made a mark on me. What are the things that make Jeju Island unique? Here’s my personal list. Probably the most interesting fact about Jeju Island is that it is a home to the tallest mountain in all of South Korea, the Hallasan. It stands 1950 meters and it is almost at the center of the island, which is why you could see this mountain at almost all places in Jeju. This mountain is very important to the locals because for them, this represents Jeju. They believe that Gods and Spirits live on this mountain. This is actually a shield volcano and there are national parks designated around the area of the mountain. People can actually trek Hallasan, but they said it’s not an easy thing to do. But for people who are on a not so physical fit side like me, I can just look at the mountain from any point and I’m happy with it. When in Jeju, do not be surprised if you see stone statues everywhere with bulging eyes and without pupils. The statues usually have grinning expressions and they have long and broad noses. Their hands are usually on their bellies and they have hats that look like a mushroom. These statues are called "Dol hareubang" which literally means “stone grandfather”. They used to be the Gods of ancient people in Jeju because they believe that these dol hareubang can make demons go away. They usually put these statues in the entrances or gates. If you go around Jeju Island, it is impossible you would not notice these statues because they are everywhere. In fact, they made smaller versions of these statues so people can buy and give them away as souvenirs. Now let’s go to a unique Jeju cuisine called black pig. If there’s one food that Jeju would like to share to the world, it is their so called Jeju Heukdwaeji or Jeju Black Pig. Sure there are a lot of restaurants offering black pig meat in the mainland Korea, but the authentic ones are found and can only be tasted at the island of Jeju. We had it during our first dinner in the restaurant right in front of Hamdeok Beach where we stayed for three nights. We had a samgyeopsal that night, but instead of regular pork, they served us the black pig meat. Well, I am not a foodie type of person so I can’t describe it much, but for me, it’s tastier than the regular pork we buy in the market. It is also chewier and the taste is so distinct you can easily identify it’s not a regular pork meat. I just hope that the black pig meat we ate was not a dottongsi (돗통시) or pig toilets, these are the breed of black pigs that were fed through a pig toilet where they consume the feces of the users of the toilet (that sounds a little bit gross though). 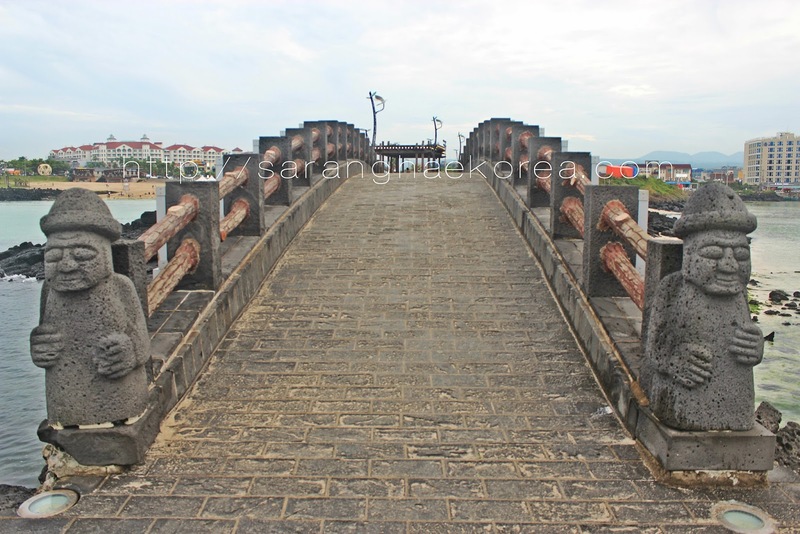 We have been to several beaches in Jeju Island. We’ve been to Hamdeok Beach, to Jeongmun Beach, Hyeobji Beach and we even went to see Lonely Rocks and Jusangjeolli rock column formations. I only noticed one thing though, that everywhere you go in Jeju Island, you will see rocks and stones everywhere. The locals could have probably ignored the presence of these rocks and stones because they are so common in the place, but observant visitors like me could not help but notice how these rocks and stones play a vital role in the culture of people living in this island. After all, these are not just ordinary rocks because these are actually basalt, a gentle reminder that these were created through volcanic activity. These rocks are usually dark in color, fine-grained and commonly form as extrusive rocks. 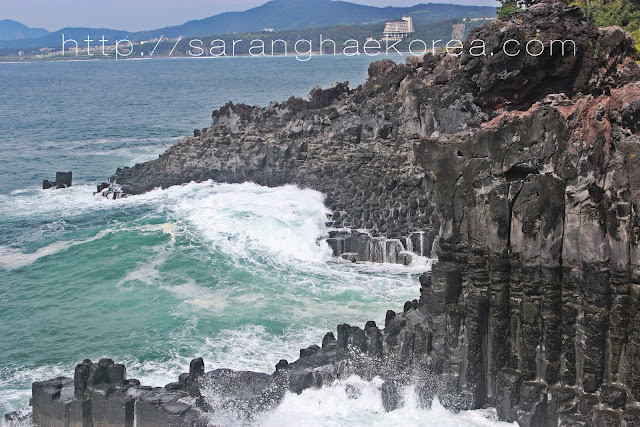 When you’re in Jeju, unless you stay in the middle of the city, it is impossible that you can’t see, feel and experience these basalt rocks. If you look at Jeju in an aesthetic perspective, it looks awesome and beautiful, no doubt on that and I couldn’t agree more. However, for me, Jeju is more of a cultural kind of island than a tourist spot. I am not really a culture vulture type of person when it comes to travel, but if you look at Jeju in a different perspective, you will appreciate the culture of the island than the things that are pleasing to the eye. I mean just think about the idea that this island is quite isolated to the mainland Korea. We traveled almost 12 hours from Seoul to Jeju. We took the bus and a ferry just to get to the island. My point here is that, because of its isolation, it developed its own language and its own culture. That is why from the beginning, I claimed that Jeju is unique. Its distinction made me appreciate the island more and I will always admire the beauty of this island not only in the aspect of tourism but also the cultural aspect. I just think that my sojourn in South Korea will never be complete unless I go to Jeju, Island. I don’t know if I can still go back to that island, but if time and opportunity permit, I would definitely go back and visit the places that I missed during my 4 day stay in the island. Looking at all those rock formations and walking in the white sands of the beaches were all so surreal. Indeed, Jeju Island is a must go to place in South Korea. This trip looks like it was absolutely amazing! The scenery just looks fantastic and I can't imagine what it is like to travel with that many people. I can totally see why this trip had been on your bucket list. What a great looking place. I honestly never heard of jeju island before. I can see why you picked this place because the pictures you took are awesome. I do not think I would ever try the black pig. I will agree it sounds really gross. Thank you for sharing your trip status. I've never really been inspired to travel to the East however, my cousin just got back from spending a year in Korea. He traveled here and fell in love with it....and I fell in love with his pictures! I find places like this fascinating. They have developed their own cultural practices that are uniquely different from South Korea so that when you visit you get to experience new things. I'd love to visit there one day! Friends of mine have been to Jeju and they've said awesome things about it! :D I really hope I get to go there soon. Thank you for sharing your experience. This looks amazing! It looks like you had a blast as well! I would love to visit this place, it looks beautiful!